According to the World Health Organization, depression is considered a global epidemic, affecting around 5% of the world population. Studies have shown that rates of depression for Americans have significantly increased in the past 50 years. Depression is a serious mental illness that is characterized by the persistent, overwhelming feelings of sadness, hopelessness, and apathy. There is no one definitive cause of depression, but rather, it is a disorder that develops over time and can be triggered by a combination of factors, like stress and hormone fluctuations. Postmenopause refers to the stage of a woman's life when menstruation has fully stopped, which occurs one year after her last menstrual period. In the United States, the average age in which postmenopause occurs is 51; however, it varies depending on genetics and lifestyle. Women between the ages of 40 - 59 most commonly suffer from depression. This can attributed to the hormonal fluctuations women experience during the menopause transition. Estrogen considerably affects the brain's regulation of moods and emotions. Consequently, women going through menopause are at higher risk of developing depression because their estrogen levels drop sharply and stay consistently low during postmenopause. Depression is not caused by one specific thing, but rather, it develops over time and can be triggered by things like stress, emotional trauma, or an unhealthy lifestyle. Depression in postmenopause is often overlooked and left untreated because many people think it is a natural part of aging. Depression is not an inevitable part of aging or menopause - in fact, it should be treated as soon as symptoms arise. The following treatments can be combined as necessary based on the individual situation. Seeking professional help is highly recommended if you think you are suffering from depression. Talk therapy and prescription medications (typically a combination of the two) are effective for treating this disorder. There are many types of psychotherapy, but they essentially involve talking about your past in order to treat present problems. Psychotherapy aims to help you learn more about yourself and improve interpersonal relationships. Getting regular exercise releases “feel-good” neurotransmitters - like serotonin and endorphins - in the brain. Exercising also promotes health benefits, like lifting mood, improving sleep, increasing energy, and reducing stress. The general recommendation is to get at least 30 minutes of aerobic exercise at least five times a week. Cycling, swimming, and walking are all good low-impact exercises. Practicing yoga releases serotonin in the brain, which improves mood and reduces stress. A German study analyzed the effects of yoga on women who described themselves as “emotionally distressed.” The women who practiced yoga twice a week for three months reported improvements in stress, depression, anxiety, energy, fatigue, and well-being. Additionally, they had less headaches, reduced back pain, and better sleep quality. There are certain herbs that have been known to help reduce depression symptoms. St. John's wort is widely used for treating depression. Depression is a serious mental illness that affects nearly 10% of American adults on average. Unfortunately, women are twice as likely to develop depression as men because of the hormone fluctuations experienced during menstruation, pregnancy, and puberty. It is important not to isolate yourself and to talk to someone about what you are going through in order for them to better understand your condition. 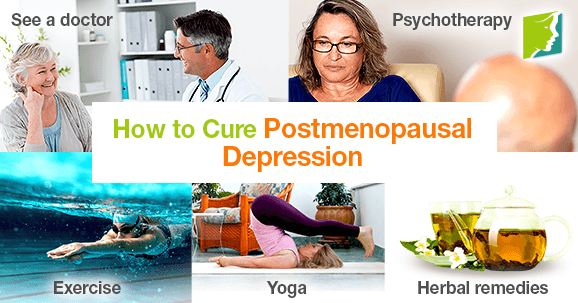 Beneficial ways to relieve postmenopausal depression include yoga, speaking with a doctor or therapist, and exercising. Read more about foods for postmenopausal depression. Are There Medications for Depression?